At face value, this Disney animated fairytale may have little to offer to many a childless adult - yet there's an infectious charm embedded in 'Frozen' that is difficult to shake. Based on Hans Christian Anderson's 'The Snow Queen', 'Frozen' offers traditional heartwarming musical, with the twist of wonderfully unexpected off-kilter humour that will appeal as much to adult audiences as it will to younger folk. The story follows two young Princesses - Elsa (voiced by Idina Menzel), who has the power to produce snow and ice, and accidentally harms her sister, Anna (Kristen Bell. Anna has her memories of Elsa's abilities erased, and Elsa is forced into seclusion at their palace. Eventually however, Elsa is required to become Queen but another accident causes her to run away, unknowingly leaving the entire kingdom is trapped in an eternal winter. Anna takes on the task of finding Elsa to help rescue both her sibling and the kingdom, recruiting mountain man Kristoff (Jonathan Groff) and his loyal reindeer Sven - the trio also meet Olof (Josh Gad), a snowman brought to life, who is more than willing to join them on their quest. Their adventure is unsurprisingly filled with action, humour, and love, but the balance is near perfect - Gad's Olof superbly encapsulates these qualities, and he delivers a terrific vocal performance. The musical element is prominent, written by Robert Lopez and his wife Kristen Anderson-Lopez, and arguably overbearing. Its expansive, Broadway style does have its anthemic and evocative moments but none match the swell of the opening 'Vuelie' - a traditional Scandinavian choral folk song, restructured by Frode Fjellheim and the film's composer Christophe Beck. In addition to the over-egged musical nature of 'Frozen', there's a troubling body ideal on offer - the main characters are impossibly shaped, more so than any Photoshopped magazine cover. It's far from an atypical technique but perhaps co-directors Chris Buck and Jennifer Lee could have adopted a more natural style. Those criticisms aside, 'Frozen' is a glorious animated tale - and, much like the seminal Disney films of old, not just one for children. 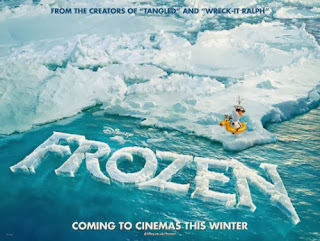 'Frozen' is out in UK cinemas from today, through Walt Disney Pictures.